The late summers of 2015 and 2016 felt a little different for Stephen Amoah. For the previous eight years, as the start of a new school year loomed, Amoah had spent those weeks outside on a steamy football field, practicing with teammates to compete in high school and college games. Although the academic cycle remains part of his life, for the past two summers, Amoah traded his football uniform for a lab coat over his shirt and jeans. He traded conditioning drills for mixing chemicals and testing light devices as part of research on organic LEDs. NC State University’s Research Building II, on Centennial Campus, replaced the athletic field as a likely place to find him, with Amoah working about 40 hours a week in a laboratory there. Now focused on Perovskite LED device fabrication, he’s still part of a team: the research team of Dr. Franky So, NC State’s Walter and Ida Freeman Distinguished Professor of Materials Science and Engineering. 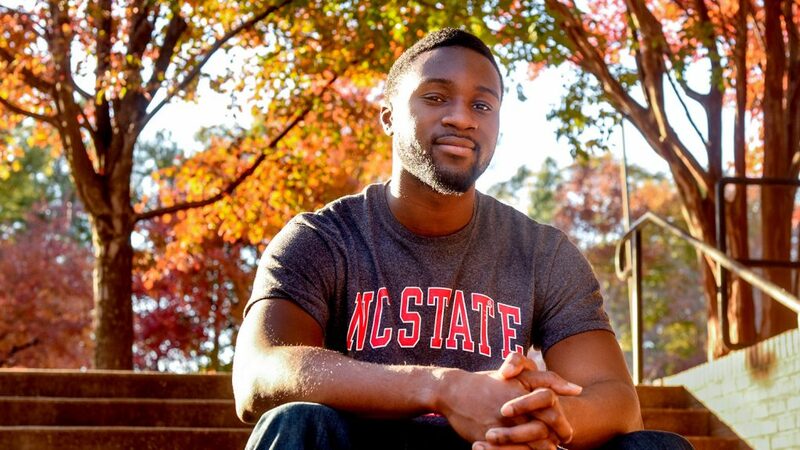 Amoah is in his second year pursuing his Ph.D. in that discipline at NC State. He is among several current students who have received Steve and Jane Warren-Wolfpack Club Graduate Fellowships, designed to help former student-athletes further their education. More than 20 of the fellowships have been awarded since 2004, with recipients chosen based on academic performance, athletics achievement, character and leadership. Born in Gottingen, Germany, Amoah grew up in Charlotte. He earned his bachelor’s degree in physics with a minor in mathematics from Lenoir-Rhyne University in Hickory. He lettered four years as a linebacker on the Lenoir-Rhyne football team, a strong program on the NCAA Division II level. In 2014, for example, the Bears won their fourth consecutive South Atlantic Conference Championship and finished 11-1 with a No. 8 final national ranking. The previous season, Lenoir-Rhyne (13-2) advanced to the Division II championship game. Amoah loved, and still loves, football. His first year at NC State required adjustments, as well as plenty of hard work. Amoah received Lenoir-Rhyne’s 2015 Dean’s Award, as well as an award recognizing him for outstanding community service. As his time at that institution wound down, he found himself considering a degree in a field such as electrical or mechanical engineering. During his junior year at Lenoir-Rhyne, Amoah applied to the National Science Foundation-funded Research Experiences for Undergraduates (REU), which offers hands-on research opportunities for students who might not typically get them. A summer REU program at NC State introduced him to materials science and engineering. The electronics component immediately intrigued him. Amoah initially hesitated to apply to NC State for admission – much less for a fellowship. His advice for other students is to always do as well as they can in their classes, network with professors and other students, and pursue door-opening opportunities such as REU. Not only did he get admitted to the university, in addition to the Warren-Wolfpack Club Fellowship, he received departmental support as a teaching assistant. “All of the support I’ve received is a blessing. It takes away a burden so I can focus on school and not worry as much about finances,” he said. He hopes more donors consider gifts to support graduate students. During his first year at NC State, Amoah took two classes and served as a TA, a role that included grading homework for a professor and helping teach a lab course. This year, he’s spending 20 to 30 hours a week as a research assistant, in addition to his classes. He is determining the topic for his doctorate and hoping to take the Ph.D. qualifying exam in engineering this month. Eventually, after another three years at the university, he hopes to work in electronics research and development for a technology company. “I really am thankful for the chance to be here at NC State,” Amoah said. Read about another Warren-Wolfpack Club Fellow, Nick McCrory – a 2012 Olympic bronze medalist in synchronized diving who is now a graduate student in NC State’s physiology program.